New music sensation El - Jay who has been called the next big thing in Nigerian music is at it again with something sizzling hot for his upcoming new hit single - Money Dance. El- Jay will giveaway the cash prize of $10,000.00 in the next coming weeks to the best video dance routine to his upcoming single 'Money Dance' and the opportunity to feature in the Money Dance video that would be shot in Dallas, Texas - USA. 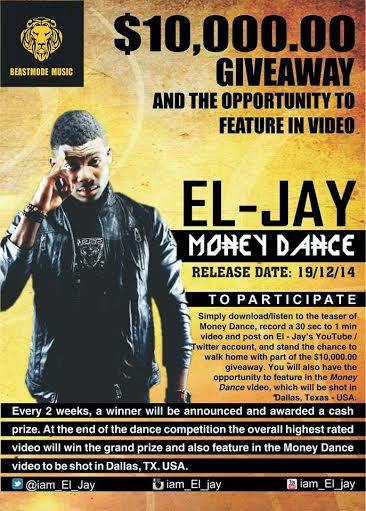 Make videos, and upload with Hash Tag #ELJAYMONEYDANCE on YouTube and Twitter. The official release date for the full song MONEY DANCE IS DECEMBER 19th, 2014. Click here to listen and download (https://www.youtube.com/watch?v=mNHiNL6IgMk&feature=youtu.be&list=UUEZVCoF42ncchhvLj0Qz13w).